What can I say? You just have to try them. Lucy’s Fried Chicken was a nice find when were in Austin a while back. Of course we ordered fried chicken but we also ordered some fried chicken gizzards (my favorite) for appetizers and tried their deep fried deviled eggs. I loved the gizzards but the deep fried deviled eggs had to be put on my list of must tries for the blog. 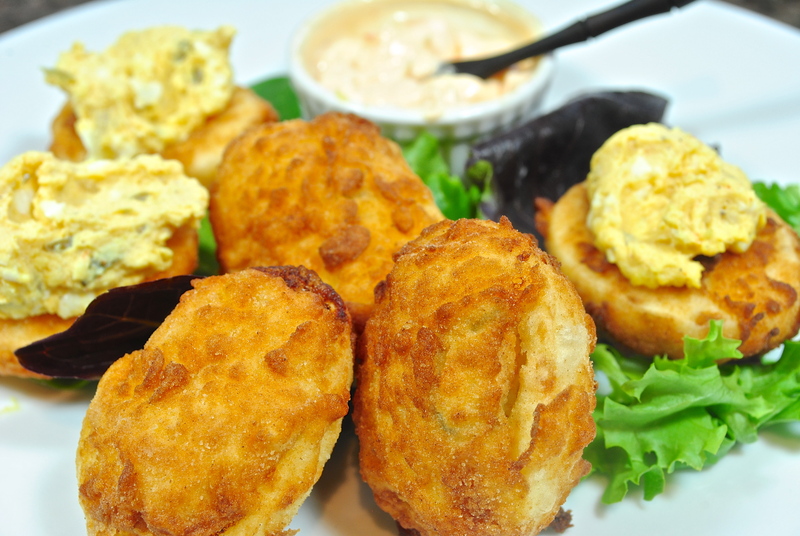 We all know that anything fried is good but in my life, I have never heard of a fried deviled egg. Couldn’t pass up the homemade moon pies either, but we were good, ordered one to go and cut it in fourths to share when we got home. I get excited finding new restaurants to try when we are visiting our kids. Olivia’s and Lucy’s are both owned by Chef James Holmes. Olivia’s was his first restaurant and Lucy is his southern sister restaurant. He has two daughters named Olivia and Lucy; isn’t that sweet. Olivia’s has been named one of the top new restaurants in America by Bon Appetite and we ate there when our son Paul graduated from culinary school. Take a look at their websites; two totally different restaurants and I love both of them. I don’t know if you are like me but I want to look at the menus before I go some place and I spend a lot of time looking at different menus anyway for inspiration. I usually know where I want to eat before I get to the city I’m going to. Why don’t you take a look at their menus if you have time. I think Lucy’s will be around for quite a while; the food’s great, the atmosphere even better and I think Olivia’s has already proven it’s self. I wasn’t sure about the deviled eggs and have decided to try them two different ways. 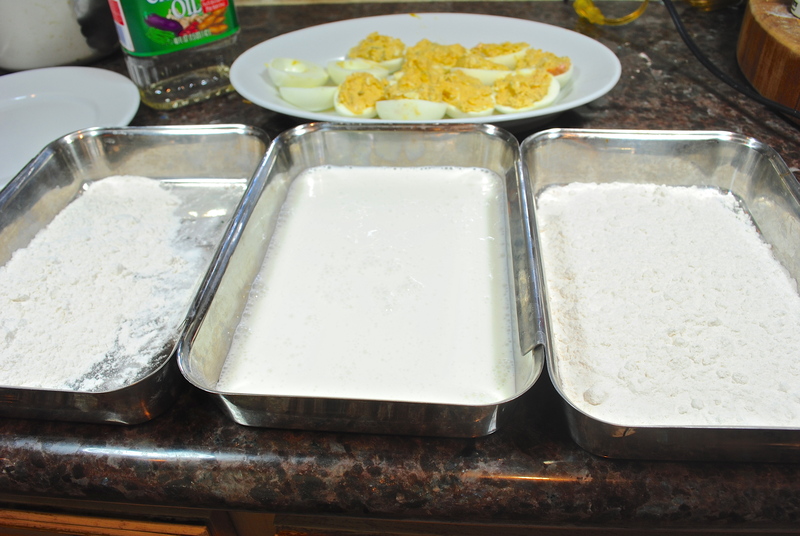 One, I’m taking the whole deviled egg half (like Lucy’s did) and putting in flour, egg and then flour (I guess that’s the way they did them) and the other way is breading just the whites, frying and then piping in the egg filling. See which one you like the best. 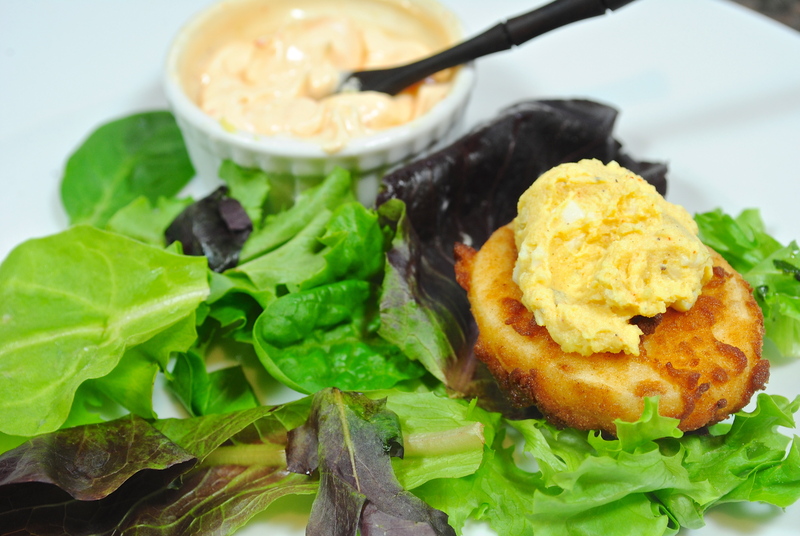 Of course you will not make Fried Deviled Eggs often but why not try them just once for a unique appetizer. *Note: I would suggest adding a little cayenne pepper to the flour for breading. BLAST FROM THE PAST: So fall is here and here’s a great little recipe to make with those apples that are dropping off the trees. Caramel apple Cake with Rum Sauce. Breading trays ready and your favorite deviled egg recipe ready to be coated. 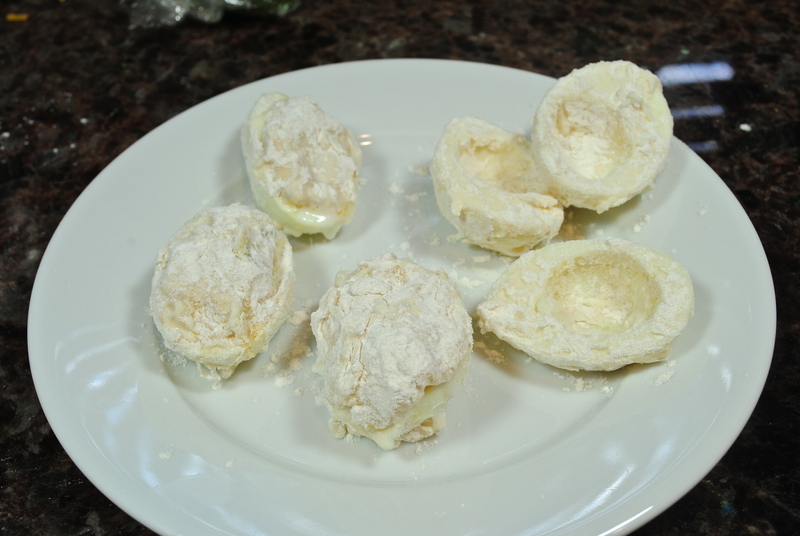 I did a few of the eggs unstuffed and then stuffed after they were fried. This is the egg that only had the white fried then I piped in some of the filling after frying. Try them both ways. Lucy’s served their eggs with a chicken skin aioli. You can simply mix some mayo with a little garlic powder and a dab of Sriricha sauce. any other things you may add to your deviled eggs. I’m not giving you amounts on the ingredients of the eggs, just fill them as you normally do with your favorite recipe. The ingredients above is how I normally make them and I never measure amounts. Just do not make them too mushy. Boil your eggs and make your deviled eggs however you like them. Don’t stuff them too full. After filling your eggs, dip egg in flour on all sides, then quickly dip in beaten egg (I used buttermilk) then flour again. Put them on a tray and have ready for frying. 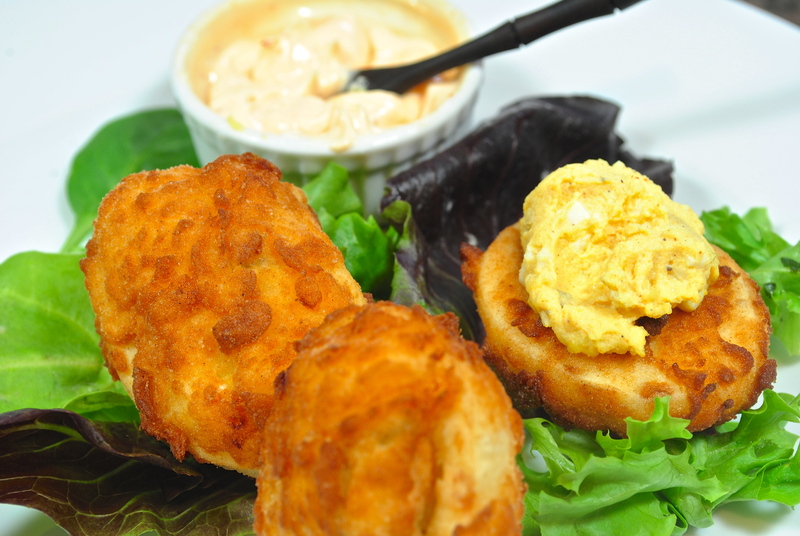 Try breading only the whites and frying and then after fried, pipe in the egg filling. See which way you like the best.